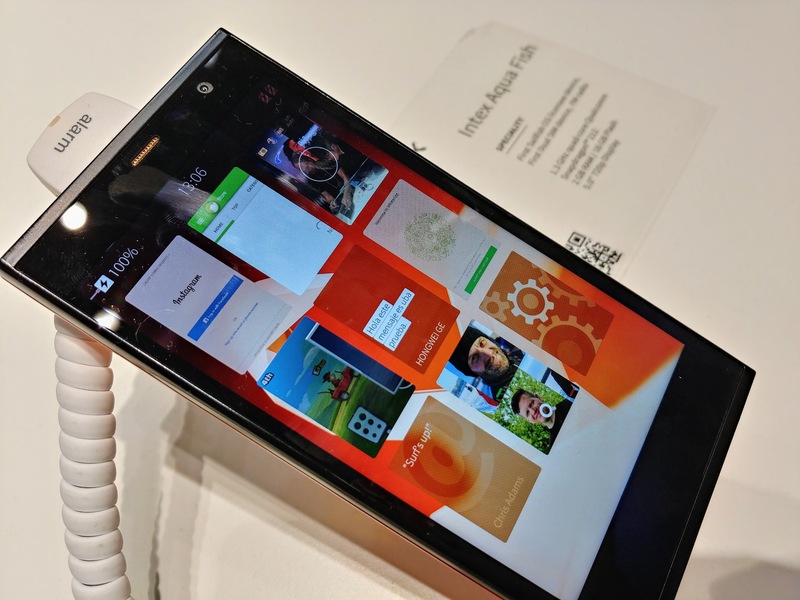 Sailfish OS at MWC 2018: A Wrap-up! 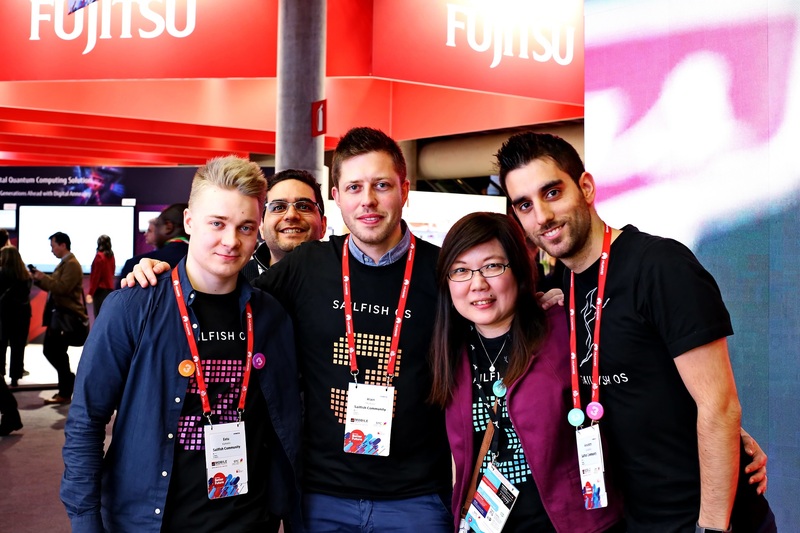 Every year for the past 6 years we have attended Mobile World Congress alongside our community, bringing Sailfish OS to so many people’s attention by showing off new devices running the OS. 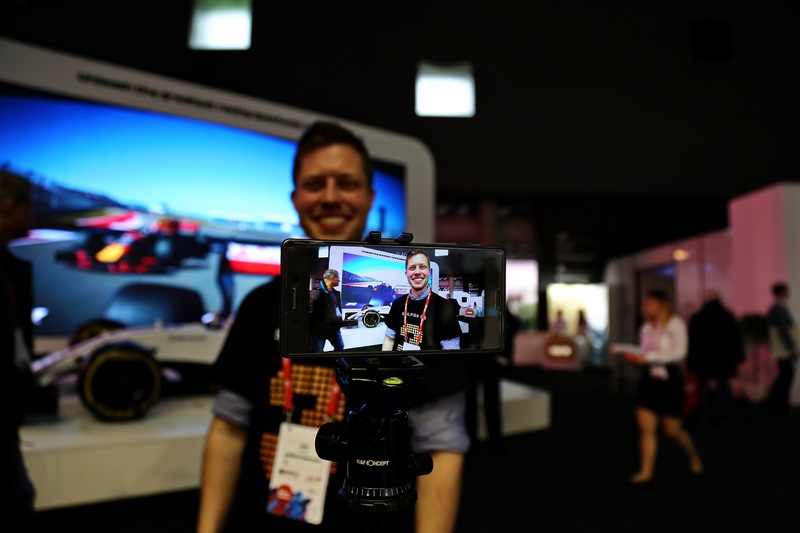 We host press events packed with journalists, to illustrate to everyone how this duopoly of mobile operating systems is playing out and there is room for change. This year was no different and we brought in many new believers into the world of the only independent and alternative mobile operating system. There were articles and event coverage on publishers like Engadget, Techcrunch, NDTV and many more major websites and publications that wrote about our adventure, latest news and how we are on our path to capture different parts of a market which is thirsty for what we have to provide. Our amazing community was, as always, present with us at the stand, helping us out especially with demoing Sailfish 3 to the public and the media, taking photos and videos of the event, giving us a hand with practically anything we asked of them to and overall being fantastic booth-babes which is always a good thing! So as always, massive thank you for your contributions! 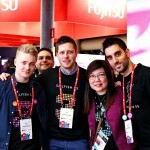 Having so many people visiting us who already know our story is always a great experience at big events like MWC and just like last year, that was what we experienced! This year is the year of Sailfish 3, meaning that a lot of our focus is going to be getting the newest iteration of Sailfish OS up and running for our users to enjoy and take advantage of its new features. Sailfish 3 introduces a number of UI improvements and new gestures for an easier and more intuitive user experience, but most of the improvements are happening behind the UI. We are updating core libraries and Android app compatibility. We are making deep system-wide security improvements to make Sailfish devices more secure and enable users to be even more sure about privacy of their data. We’re also improving support services for regional licensees to establish independent R&D centres by enabling steady releases & OS upgrades, local hosting, training, and a flexible feature set to support specific customer needs. We plan to roll out Sailfish 3 in phases to our customers and users starting in Q3. 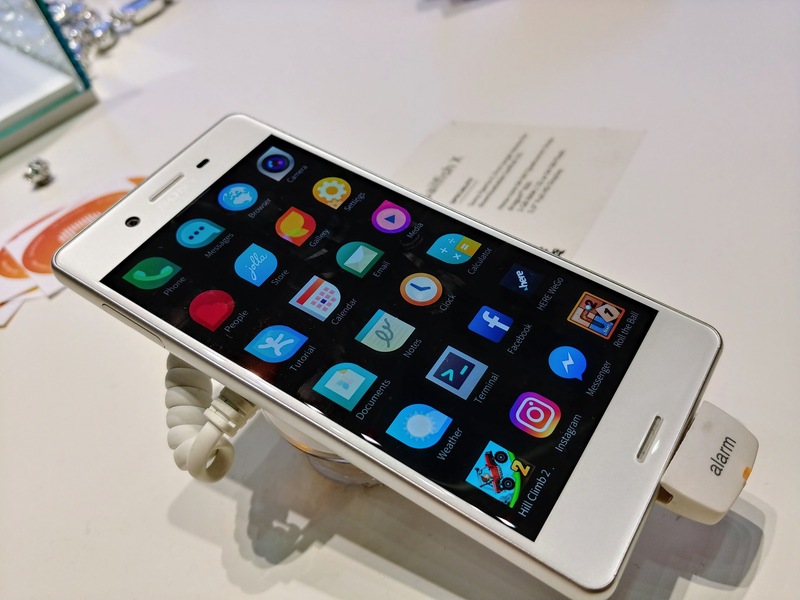 One of the biggest highlights of the MWC this year was the strong comeback of feature phones from many different manufacturers. Here at Jolla we’ve also been hard at work, expanding the diversity of Sailfish 3 and bringing it onto 4G capable feature phones. Sailfish 3 makes them feel more usable, more premium and allows the devices to run selected Android apps. We believe there is a big opportunity in feature phone market for Sailfish 3. Millions of people are looking for an affordable solution that can take advantage of more modern applications available on current, more premium smartphones. 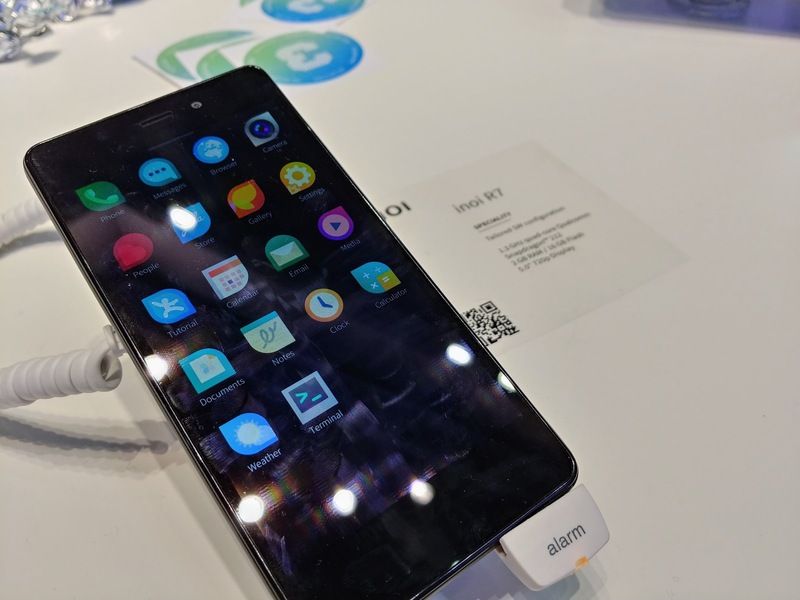 Sailfish 3 for feature phones was showcased as a prototype on a sample device during MWC and was positively greeted by the audience. 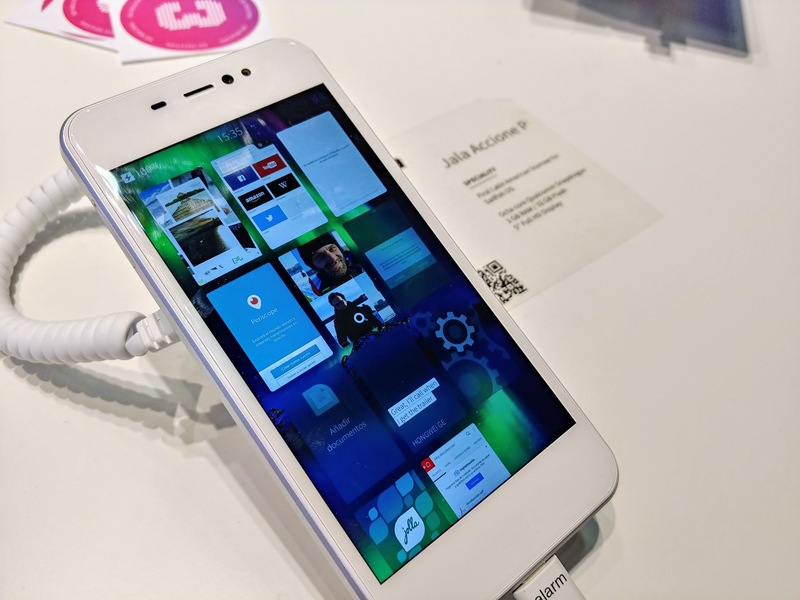 Sailfish X as the world’s only downloadable mobile OS has become a great success in terms of sales and popularity in the media and we get the message! That is why we are working on expanding Sailfish X for more devices. As we stated in our latest Roadmap blog update Sailfish X is going to be available on the dual-SIM variant of Sony Xperia X (F5122) alongside devices that were not announced at the time. We proudly announced during MWC that Sailfish X is soon going to be available on the new Sony Xperia XA2! 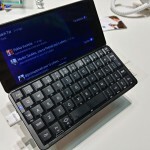 We are also working with Planet Computers to make Sailfish X available for the the Gemini PDA! 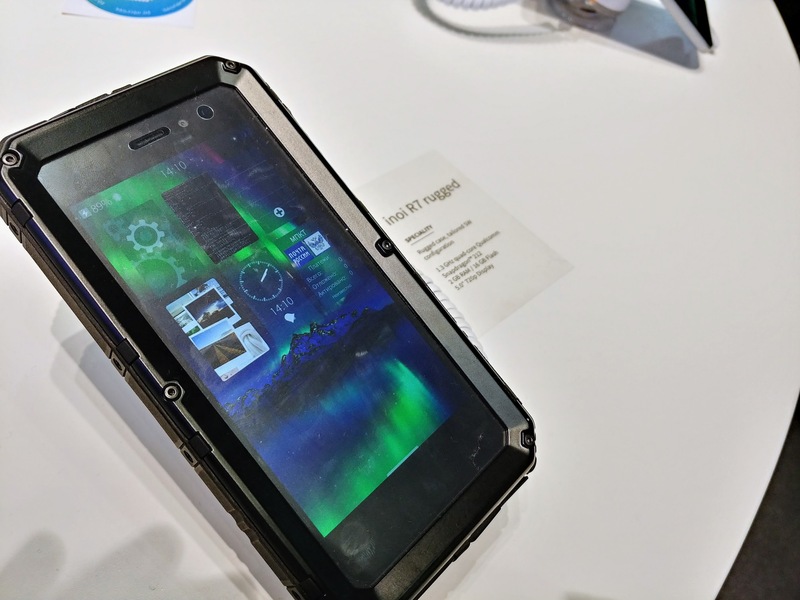 Another highlight of Sailfish OS at MWC was a lineup of devices announced by our Russian partner INOI running Sailfish OS out of the box. The rugged INOI R7, made for tough working environments grabbed a lot of attention due to its shape and and durable appearance. 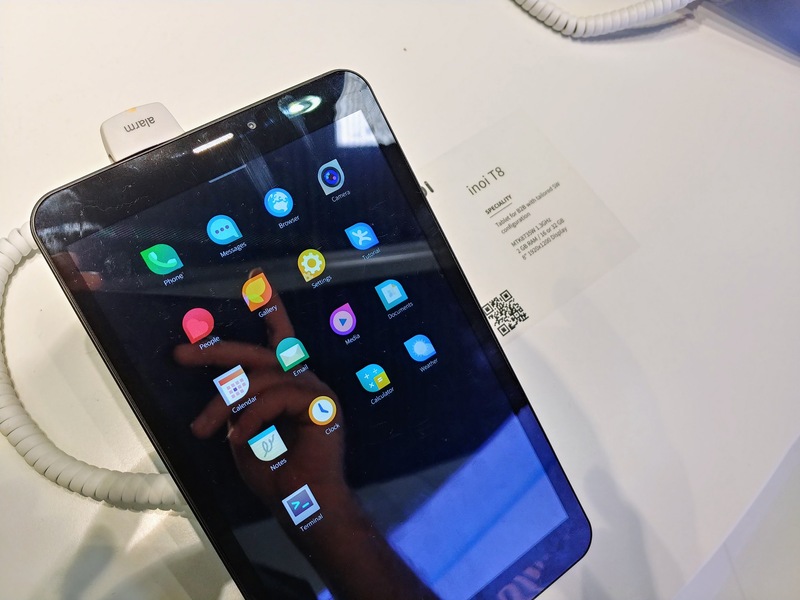 INOI also showed off two tablets, named the INOI T8 and INOI T10 which will be targeted to Russian corporate customers. 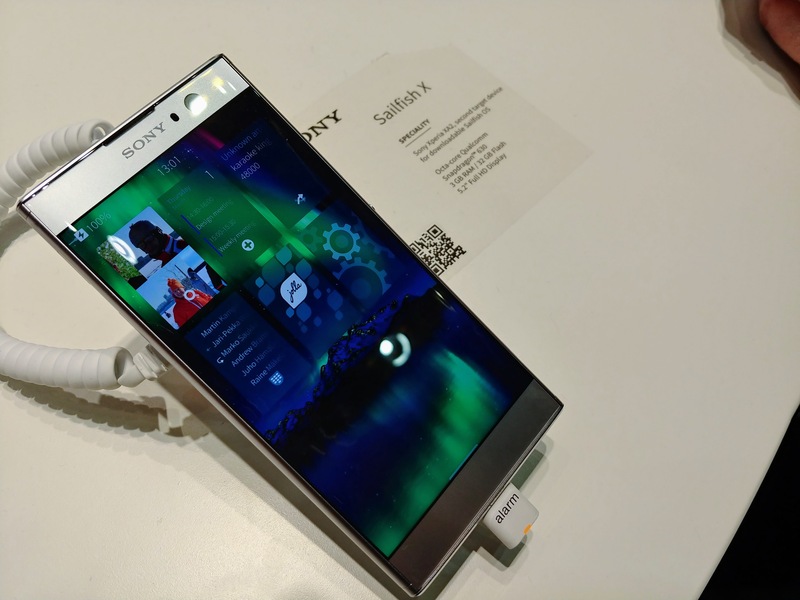 This year, we had 10 devices running Sailfish OS ready for demos to the passers-by on the main table of our stand, with a glass box showcasing two of the hottest products, Sailfish OS on feature phones and Sailfish X on Sony Xperia XA2. The Sailfish-powered devices we showcased included our very own limited edition Jolla C, the fresh and beautiful Sony Xperia XA2 alongside its brother, the Xperia X, Planet Computers Gemini PDA grabbing all the attention from the media and the people around it, Jala Accione and Accione P, Intex Aqua Fish, Inoi R7 and R7 Rugged and last but not least, the 8″ INOI T8 tablet. Good to see things progressing. Looking forward to Sailfish 3. Indeed! We all are eager to finalise the product and make it available! I would like to know if we are going to receive a refund of our money. It’s important to me and I think they laugh at us. Nobody is laughing at you. It is as important to us as it is to you. However, this post does not reflect on refunds whatsoever and we will get back to you on that with an update to the actual refund blog post. If after years, I still have not received the money. We have to make ourselves heard either in this article or in another. And yes, I think this sounds like a joke and they laugh at us. I hope this is over soon. Well, didn’t you already get ½ of your money back? They are refunding the rest when they make profit. This year or the next will possibly look bright for the company so you will get the rest. In what universe half is enough if you paid full ? Are you ok if your employer only pays you HALF your wage this monht ? And will you loan me 1000 dollar and I will only pay you HALF back ? Maybe this is ok with you, but for 99,9999999999999% of the population of this planet this is NOT OK !! And what year would that be? Great. Looking forward to Sailfish 3. Android app compatibility means new runtime? Can you say which version of android? That’s fantastic! Let’s keep our fingers crossed for a speedy delivery of the OS. different chipset, different Android version, all makes it a more challenging environment for our engineers to work. But it is happening! That was pretty good wrap-up! Done! Take a step back and evaluate the situation. The refund blog post needs some love after months with of silences. I know you don’t have any news but when jolla takes 4 month refund break one can get some bad thoughts. A wrap app would be good. At least to keep up with reality. You know the answer to your comment already. We are not putting this behind, and we will come back to you with an update when we have it. Although, out of the 10 devices, 9 are official Sailfish devices, supported by Jolla for different markets. The only one that wasn’t official was the Gemini PDA which we are working with Planet Computers in order to make it happen. Let’s see how it plays out! I should receive my Gemini next month. Most people seem to want this device as productivity and developer device whereas phones are more suitable for consumption. It would be great if there was a way to run arbitrary Linux (GUI) software on it with Sailfish, not only Sailfish, Android and text mode applications. – hope that the toolkit used by your app is working on Wayland (GTK and Qt are getting there eventually) so the app can be used directly on Jolla. Well, GTK and Qt would be fine for me and they both support Wayland. Ubuntu is now Wayland by default, so Wayland is mainstream already. I don’t think that XWayland would be required anymore. But without ‘official’ gtk+ libraries and a desktop, I don’t think anything will ever leave the proof-of-concept phase. Then it’s easier for people to go for Debian on Android or pure Debian. Long time no see. Any news on updates? Great. Now you can give back the money you took from tablet backers! What about the Fairphone 2? I thought it was with sailfish also…. I’m not really convinced the rather substantial re-tooling of the UI necessary for feature phones is what you want to spend your time and money on unless you’ve got paying license partners asking you to do just that. Smartish feature phones can be a niche where Sailfish could gain some volume. Not to mention, that market is still huge in volumes and is reborning – thanks to the new 3310(?). Last year at the same time we dreamed about a new potent HW to replace our Jolla 1, Jolla C and Fairphone 2 Handsets. Thanks for giving us Sailfish X. Looking forward to Xperia XA2 and (my absolute Nr.1 ) Gemini PDA. 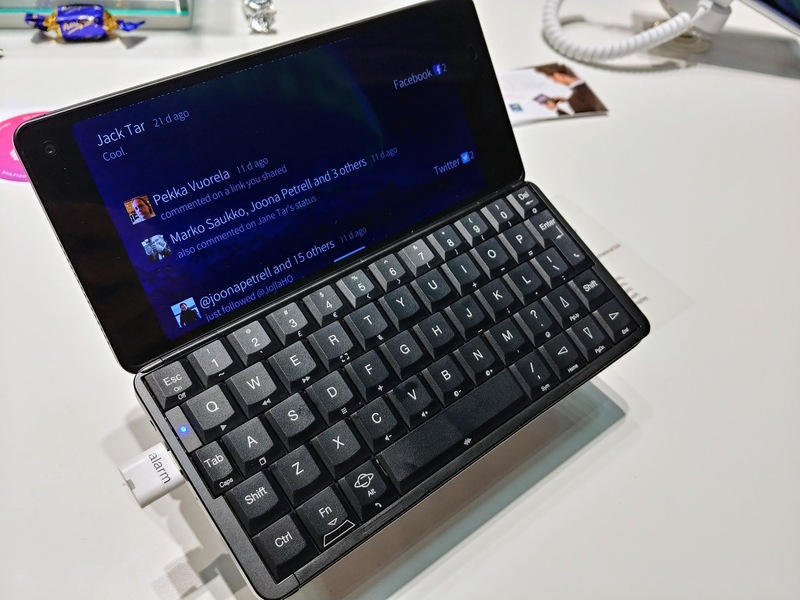 SailfishOS with Psion Series 5 Keyboard – thats exact, what we freaks a dreaming about…. @James Noori…don’t get me wrong now… I have registered already 8 devices (3 Jolla 1, 2 tablets, 1 Jolla C, 1 Aqua Fish, 1 Xperia X) and I am supporting you whereever possible. Even my wife is close to use a Sailfish device in the near future… either an Dual SIM XPeria X or an Xperia XA2 in case Dual SIM is supported for XA2 as well. 1) you are not able/willing to fix this Bluetooth nightmare on the Xperia X which is simply pure scrap. 2) you are ignoring tons of comments in TJC and here in the blogs. 3) you will release SFOS more more devices and will keep this Bluetooth bug unsolved? For all official Jolla device there never was any problem connecting them to all cars I am using…. but the Xperia X doesn’t connect to any car and is just sleeping on my desk since 6 month now and it is not usable as daily device due to this Bluetooth scrap. And in case your team is not able to fix the car connection issue ASAP! based on international Bluetooth standard profiles I will have to retire the X before having used it one single day. Can you please comment on this here in this blog since your team is ignoring this nightmare in TJC completely? I am expecting an answer from you here and now!!! Yes, they run ahead for visions, but what they have, Xperia X – can you use it on daily basis for all what you need and wish with your phone. I was so disappointed with the cam and photo editing with Sailfish compared with original Sony technology, that i did away with Sailfish for Android, and there you have now a phone for use. I think that they are with too less resources and Sailfish should go to the team that have those resources and make things ready. I am also waiting for an improvement of the camera software. The pictures are very disappointing (weird yellow coloured, focus not good working). Now I take my ipad with me when I intend to make pictures, which is not very convenient. 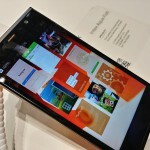 So I too hope that the Jolla team starts working on it, as with bluetooth. I am sorry to contradict you, but my Xperia X is able to connect to both my Volvo V40 (2017) and my wife’s Audi A3 (2006). @lupastro…. good for you ;)…. However.. when I am reading the complaint in the “Sony Xperia & Bluetooth” thread in TJC I still doubt that it was implemented properly resp. completetely. For MB C-Class Audio 20 (11/2016) and for KIA Rio (2013) it definitely doesn’t work at all and it is a shame that all old Jolla devices don’t have any problem to connect but the X just Fails. After playing a bit around this Bluetooth topic it is working now… Seems there was some SIM card related problem. Both audio systems could be paired and also reading the address book is possible which was not at first tries. Which unsupported/missing standard profiles are you talking about ? I haven’t found a Bluetooth (non-LE) device I couldn’t pair with my Xperia X yet. To me it seems that the Bluetooth driver stack works correctly and supports the needed profiles, only the UI sometime initiate it the wrong way around when pairing. LE is another matter (command line tools exist, but no a single UI apps use it yet). As is Android support (Alien-dalvik doesn’t translate BlueZ-to-BlueDroid, so only standard devices handled on Sailfish side (e.g. : keyboard, speaker, etc.) work, but no custom Android apps). Well…I don’t know which profiles a device usually is supporting… I guess at least HFP, A2DP, HSP, PBAP (PBA), (maybe SIM? ), OBEX, OPP and maybe some more should be implemented in that way that other devices are able to handle it. For HFP I can say that it is working for Jolla 1 and C but not for the Xperia X in my cars. I know it seems to be related to the bluez4/bluez5 switch. MB Audio 20 (11/2016) tells me that the Xperia X doesn’t support the required profile. And KIA Rio is somehow shown as paired device but without any functionality. So please don’t tell me that the Bluetooth stack was implemented correctly. Using command line maybe can help with the KIA Rio.. but for the MB Audio 20 for sure it will not. nice to hear that Jolla is alive and kicking. 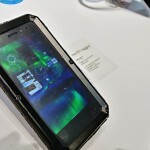 What about the Youyota tablet, which seems to be the same hardware as the Jolla tablet. 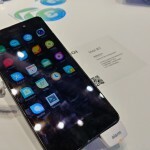 Are you already in negotiation with the Youyota team for licensing Sailfish OS? 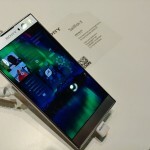 I wonder, is there specific version of Sony Ax2 in which Sailfish runs? Jolla has great designers for their OS, they really need to help their OEM hardware manufacturers design a good-looking phone!!! just some suggestion for Jolla. – Hope for a Nokia E90-like phone, dual screen phone, front display for feature phone mode, when unfold, you have the normal sailfish OS mode. All the best for the coming new Sailfish OS 3 for Sony X.
I’m user for two phones one Android (for business) and second Sony Xperia F5122 with SFOS (for fun) why two? ?, because Sailfish OS is simple super but have mistakes. – swype keyboard for faster swyping, I use swype years on Android and typing (not swyping) is like prehistoric for me. – office with dropbox, mega sync support. – WhatsApp much better than apk app (camera is horrible..,and not working properly). 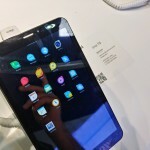 -and connection with external display like Samsung or Huawei. You already made the step from Android to Sailfish. Time to take the second one and find alternatives to WA, Google Calendar and Dropbox. This solves half of your problems. We like Sailfish. My husband still uses his Jolla 1 and I use an XperiaX Sailfish. They are our daily phones, but because of the many things lacking on Sailfish we also use ipads. No google/android for us! We would like to make calls with Telegram on our phones. This is not possible. When will it be? Threema is nice indeed. Downloaded it years ago, but could not convince others to join. Yet, our whole family is on Telegram and I have to admit, Telegram is a brilliant medium. And family does not want to change again. Wire is also nice. Recommended! We use this instead of Skype. But not with Sailfish, because it is not supported. Would it kill Jolla to rectify the battery problem with SailfishX on the next update? I can’t speak for others, but the battery drains quickly and that is frustrating! It’s nice to see all this devices, bit the main problem is that most of them are not available. 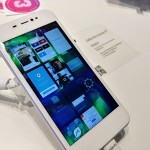 What about the Jala Accione (P) – can this phone be bought with Sailfish OS right now (after half a year that it was announced)? Will it come to other markets than Bolivia? 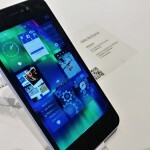 Will we see this feature phones in stores or is it just a tech demo? Don’t get me wrong, I really like Sailfish, but my current Sailfish Hardware (Jolla C) is much to slow for a every day use. A lot of Apps need newer android versions to run or even start (Okay, Work in Progress). We need more device, we need a better app store, and perhaps the major android apps should be in sailfish store (I know, it’s nearly impossible to convince the major android developers to do so; they mostly even don’t use the Amazon app store or if the do forget to publish the updates there…). Looking to future technical requirements there was still no word if Sailfish 3 will support Progressive Web Apps (PWA), and if the implementation of RCS-Services (the future of a mobile phones main use which is communication) for calls, messages and even video chat will ever happen. 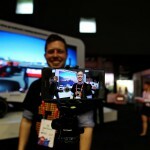 I too would love SFOS on any of the new Nokia products! Less than 20 hours and sparely using it, that’s how it is now. I think this is also a problem with other devices and OS-es. There is a sufficient discussion on together.jolla.com about fitting batteries you can buy for ~10€. I used the PolarCell without problems in the J1. You won’t have guarantee anymore anyway. But I’m not willing to use a 3rd party battery due to safety concerns as I’m not that desperate for SFOS! Had been using that one for nearly 2 years (since they were launched, until very recently) without any problem. Once again Jolla tantalises its fans with the promise of new toys to run SFOS. Dear Jolla team and fans, this is what I often said to Jolla too: only a paid for system is sustainable and will give quality. Developers need to earn their living and customers need good working devices and privacy safe apps. You only can get it when you organize a solid paying system. Until now only Apple did this although its devices are overpriced. in principle agree, but in reality the sailfish environment is too small. Paid apps only work with a reasonably large number of potential customers, a few Euros here and there won’t cut it for a developer. In the current situation imho a solid paying system won’t help. It has been 4 months since an update on the Jolla Tablet refunds? It is starting to look like you are attempting to sweep this under the rug. please refund the remain part from the tablet! By doing it ASAP you may gain new clients! When the sailfish x available in asia? Im really want to try it. Still no news after the heady reports from MWC promising Jolla fans the earth. I would like to thank you very much, all the team of Sailfish OS. I am using your OS since november and I love it ! And my family too ! I like the feeling of freedom, this sense of not being in spy permanently, the battery which lasts a lot longer and the gestures of the OS. I hope never have to go back one day on iOS or Android (my last OS phones). I’m going to list, according to my experience of these last few months, what I missed personally using Sailfish X and some of the problems I met. In the hope that my post can be useful for you. Thank you again! – Receive notifications of mail reception in the different folders. For now it is only for the inbox. – Possibility to add notes to contacts. – Choice of the search engine for the Internet browser : allow to choose the one that we want and not only from a limited list (I prefer using duckduckgo or qwant for example). – A complete user guide. With all the tips and tricks, for example how to make a screenshot with the buttons, …. – when the phone is charging : the touch screen become hypersensitive. For that I met some difficulties using it while charging. – Sometimes there are problems while the phone is charging : if the phone is turn off, it restarts constantly. – problems with video calls of android applications : video doesn’t work. – The screen turns off when I am recording video. Recording does not stop but we don’t see anymore what we are recording. Thanks a lot for your feedback! We are happy that you are using Sailfish OS and are rather satisfied with it. We hope that we can get to implementing the features you have requested as well. BraapBraap, can you clear up your counting a bit ? 203 days on April 25 and 876 on May 4 ? My guess the 876 is more accurate and I join you in my concern if we EVER get our money back from these thieves. If you belief that the money from the tablet project would be reimburced, then I guess you might have to change your expectations on this! (Boardmembers and similarous share holders left, CEO,Marketing…and so on)also the strategy of the company changed. While the founder of Jolla where interested on the consumer market, the “new” owners are not. They want to sell Sailfish on the B2B field. From a purely pragmatic point of view, there’s one reason to not completely exclude tablet re-imbursement : PR / Marketing. Managing to eventually reimburse the tablets would make the the company (and thus the “Jolla” and “Sailfish” brands) look good, which is still a nice thing to have if you attempt to do business (even if you mostly do business with other businesses). So it’s a small cynical argument in favor of not completely dropping the idea. On the other hand, the main target for Jolla for now is to survive, so don’t hold your breath waiting for the money. They’re going to progress extremely slowly, only very rarely doing reimbursement here and there, when they happen to have some left-over cash. No blog post since 1.5 months. Waiting for Jolla status update. It’s been months since the last update and years since the tablet fiasco. Are you hoping enough people will die in the meantime so you don’t have to pay them out? Seriously tho, I don’t think Jolla understands how bad this is for their business. Even if there are only a few people posting here and complaining about refunds – all of them will remember. I’m usually not one to be vocal in comments about things like this and it’s my first time posting here but even I will not stop to tell every friend about how awfully things are handled at Jolla and that they should never buy any Jolla or Sailfish branded device, ever. Until I receive my full refund, that is. It doesn’t matter if Jolla is now no longer targeting end-users – we are still the people that have to buy devices with your OS on it to make you any buck. I don’t understand, why you guys don’t understand, that Jolla is a company making business in the corporate sector. They do no business with “normal customers”like you and me! 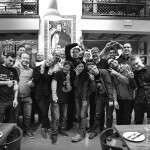 Jolla try to support the community, here and there, and Sailfish X is a very good proof for it, but we are not important as customers for Jolla anymore. You can cry, so loud and so often you want, but you will get the second half of refund, as soon, as Jolla has free cash, which the company earned! At the moment they burn Investor cash. Only if SailfishOS will be successfull on the corporate market – they might earn some money and pay you (and others) the second half of the refund. 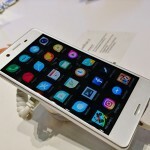 What would you change, if you tell your friends not to buy by Jolla? What could you friend buy? 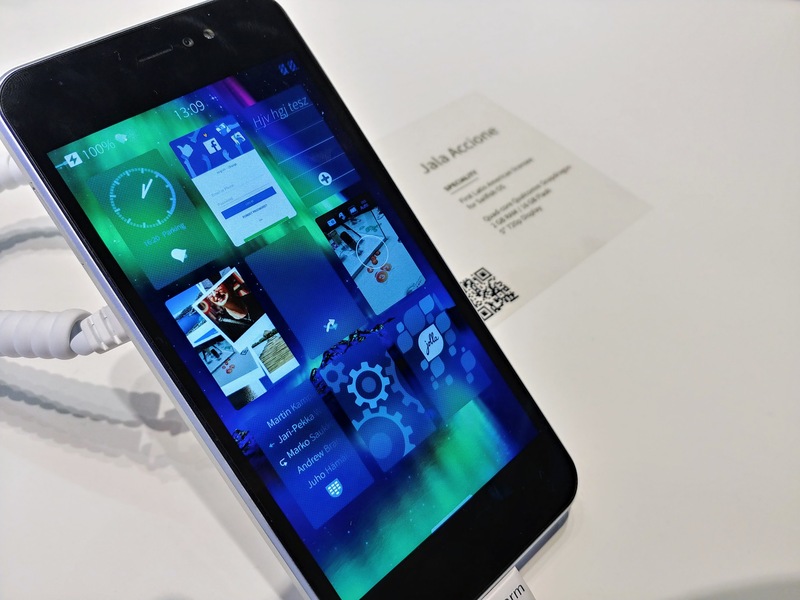 People, who know what is Sailfish – will buy it, other – probably not. But you will not able to change something. So: Relax, sit back, drink tee. 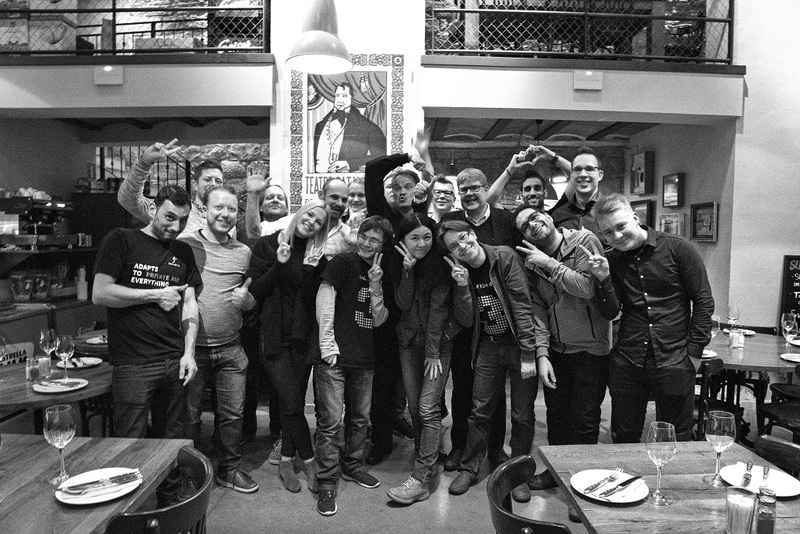 When Jolla has some cache – they will pay you the second half. I think its fair enough. Because crowdfunding is risky. Do you know, what happens to Pebble 2 or Yoyota Tablet crowdfounders ? They will probably get no cash back at all. Not a half, not a third. As the only Costarrican with a Jolla phone (well I actually have the original jolla (bought it twice) the intex and two xperia x) how can I get a Jolla shirt or a sailfish 3 shirt? It would mean a lot to me to support the community with a shirt here at home.